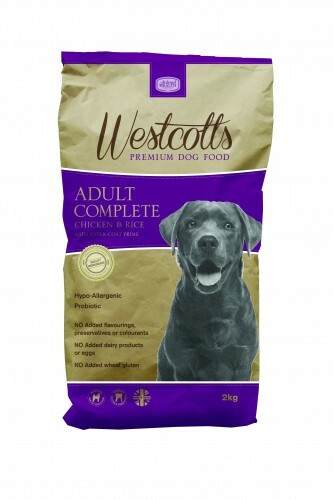 Westcotts from the Animal Health Company is a complete premium dog food produced using only premium quality ingredients. Specially developed for the competition show dog, Westcotts also provides a number of additional health benefits for canines with skin complaints and specific dietary requirements. Containing Hyper-Coat Prime a popular supplement for canines also produced by the Animal Health Company the luxury dog food provides essential omega oils and fatty acids to maintain a healthy skin condition and a show winning coat. The quality feed comes in the form of a crunchy kibble and contains calcium and phosphorus promoting healthy, strong teeth and bones. Formulated with high levels of chicken and rice, Westcotts is ideal for dogs with a sensitive digestive tract whilst also extremely palatable. Produced using premium quality ingredients Westcotts is hypo-allergenic, pro-biotic and has no added flavourings or preservatives. Free from dairy, eggs and wheat gluten, Westcotts premium dog food delivers a complete balanced diet and delicious taste for canines. The Animal Health Company also produces an extensive range of canine health and grooming products. For more information please visit our website, http://www.animal-health.co.uk or call us on 01787 476400.